Microsoft introduced Multi-Tool Notepad, a mouse-based text editor written by Richard Brodie, with the $195 Microsoft Mouse in May 1983 at the Spring COMDEX computer expo in Atlanta. Also introduced at that COMDEX was Multi-Tool Word, designed by Charles Simonyi to work with the mouse. Most watching Simonyi's demonstration had never heard of a mouse. Microsoft released the Microsoft Mouse in June 1983, and the boxed mouse and Multi-Tool Notepad began shipping in July. Initial sales were modest, as there was little one could do with it except run the three demonstration programs included in the box (a tutorial, practice application and Notepad) or program interfaces to it. The Multi-Tool product line began with expert systems for the Multiplan spreadsheet. On the suggestion of Rowland Hanson, who also convinced Bill Gates to change the name "Interface Manager" to "Windows" before the release of Windows 1.0, the Multi-Tool name was killed by the time Word shipped in November 1983. Hanson's rationale was that "the brand is the hero". People didn't associate the stand-alone name Multi-Tool with Microsoft, and Hanson wanted to make Microsoft the hero, so the Microsoft name replaced "Multi-Tool". Notepad is a common text-only (plain text) editor. The resulting files—typically saved with the .txt extension—have no format tags or styles, making the program suitable for editing system files to use in a DOS environment and, occasionally, source code for later compilation or execution, usually through a command prompt. It is also useful for its negligible use of system resources; making for quick load time and processing time, especially on under-powered hardware. Notepad supports both left-to-right and right-to-left based languages. Historically, Notepad did not treat newlines in Unix- or classic Mac OS-style text files correctly. However, on 8th May 2018, Microsoft announced that they had fixed this issue. Notepad offers only the most basic text manipulation functions, such as finding text. Only newer versions of Windows include an updated version of Notepad with a search and replace function. However, it has much less functionality in comparison to full-scale editors. In all versions of Windows, Notepad uses a built-in window class named EDIT and the maximum file size that Notepad can open is dependent on operating system limitations on the size of the EDIT window class, with the limit being different for each version of Windows. Due to the operating system limit of the EDIT window class, the Notepad version shipped with Windows 3.0, Windows 3.1 and Windows 3.11 could not open files larger than 54 KB (kilobytes) and Microsoft recommended not to open files larger than 45 KB, with the official workaround advice provided by Microsoft being "Use another text editor", but this limit was extended to 64 KB in Windows 95 (and remained the same in Windows 98 and Windows Me), with users now directed to WordPad to open larger files. On the Notepad version shipped with Windows XP the limit was 32 MB (megabytes) with the application displaying the message "The file is too large for Notepad. Use another editor to edit the file" if the user attempted to open a file larger than 32 MB. Newer versions of Notepad can open files at least up to 58 MB (megabytes) in size, and on Windows 8.1 the Notepad application is able to open files at least as large as 512 MB (megabytes) but fails to open 1 GB (gigabyte) files displaying the same message that Windows XP users would see ("The file is too large for Notepad. Use another editor to edit the file"). Up to Windows 95, Fixedsys was the only available display font for Notepad. Windows NT 4.0 and 98 introduced the ability to change this font. As of Windows 2000, the default font was changed to Lucida Console. The font setting, however, only affects how the text is shown to the user and how it is printed, not how the file is saved to disk. The default font was changed to Consolas on Windows 8. Up to Windows Me, there were almost no keyboard shortcuts and no line-counting feature. Starting with Windows 2000, shortcuts for common tasks like new, open and save were added, as well as a status-bar with a line counter (available only when word-wrap is disabled). In the Windows NT-based versions of Windows, Notepad can edit traditional 8-bit text files as well as Unicode text files (both UTF-8 and UTF-16, and in case of UTF-16, both little-endian and big-endian). Notepad accepts text from the Windows clipboard. When clipboard data with multiple formats is pasted into Notepad, the program only accepts text in the CF_TEXT format. This is useful for stripping embedded font type and style codes from formatted text, such as when copying text from a web page and pasting into an email message or other WYSIWYG text editor. Formatted text can be temporarily pasted into Notepad, and then immediately copied again in stripped format to paste into the other program. Notepad can print files, but doesn't print correctly if Word Wrap is turned on. Headers, footers, and margins can be set and adjusted when preparing to print a file under Page Setup. The date, file name, and other information can be placed in the headers and footers with various codes consisting of an ampersand ('&') followed by a letter. The Windows NT version of Notepad, installed by default on Windows 2000 and Windows XP, has the ability to detect Unicode files even when they are missing a byte order mark. To do this, it utilizes a Windows API function called IsTextUnicode(). However, this function is imperfect, incorrectly identifying some all-lowercase ASCII text as UTF-16. As a result, Notepad interprets a file containing a phrase like "aaaa aaa aaa aaaaa" ("4-3-3-5") as two-byte-encoded Unicode text file and attempts to display it as such. If a font with support for Chinese is installed, nine Chinese characters (桴獩愠灰挠湡戠敲歡) display. Otherwise, it displays squares instead of Chinese characters. Some people misinterpreted this issue for an Easter egg. Many phrases that fit the pattern (including "this app can break" and "bush hid the facts") appeared on the web as hoaxes. Windows expert Raymond Chen correctly attributed it to the Unicode detection algorithm. This issue was resolved in Windows Vista and newer versions of Notepad. Notepad does not require a lock on the file it opens, so it can open files already opened by other processes, users, or computers, whereas WordPad cannot. Also, since Notepad lacks advanced formatting functionality, many people find its simple, minimalistic user interface (whose look has never changed since Windows 3.1 and whose menus were last altered in Windows XP, when "Format" and "View" replaced "Search") faster and easier to use for basic text operations. The MS-DOS Editor, especially as updated in Windows 95, where it became an MDI application, also provides many features never offered by Notepad. There are many third-party replacements for Notepad with additional functionality, including both free software (e.g. Notepad++ and Notepad2) and freeware (e.g. TED Notepad). Notepad lacks many basic features available in other text editors such as block-select and MDI. 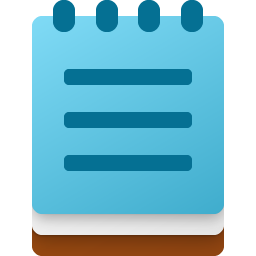 Notepad being a basic text editor, advanced features are also missing: syntax coloring, code folding, regular expressions, macros, support of codepages and color schemes. ^ "COMDEX: Micros in American mainstream". InfoWorld. IDG. May 23, 1983. p. 1. ISSN 0199-6649. ^ "Mouse and new WP program join Microsoft product lineup". InfoWorld. IDG. May 30, 1983. p. 10. ISSN 0199-6649. ^ "Microsoft ad". InfoWorld. IDG. May 23, 1983. p. 85. ISSN 0199-6649. ^ a b Wallace, James; Erickson, Jim (1992). Hard Drive. Wiley. pp. 238–244. ISBN 0-471-56886-4. Archived from the original on 2017-02-02. Retrieved 2017-01-28. ^ "In Focus". InfoWorld. IDG. August 29, 1983. p. 31. ISSN 0199-6649. ^ a b Manes, Stephen; et al. (Paul Andrews) (1993). Gates. Doubleday. ISBN 0-385-42075-7. Archived from the original on 2017-02-02. Retrieved 2017-01-28. ^ "Microsoft ad". InfoWorld. IDG. April 25, 1983. p. 40. ISSN 0199-6649. ^ "In designers' scenario, software undergoes behavior modification". InfoWorld. IDG. August 29, 1983. p. 34. ISSN 0199-6649. ^ "Introducing extended line endings support in Notepad". Blog. Microsoft. May 8, 2018. Archived from the original on 2018-05-09. Retrieved 2018-05-09. ^ "Maximum File Size Limits for Notepad". Support. Microsoft. September 24, 2011. Archived from the original on 2016-01-14. Retrieved 2016-10-28. ^ "What is file size limit for Notepad in Windows XP". Bytes. October 24, 2007. Archived from the original on 2016-10-29. Retrieved 2016-10-28. ^ "Maximum size for notepad file". Code Project. August 4, 2012. Archived from the original on 2016-10-29. Retrieved 2016-10-28. ^ Petri, Daniel (October 23, 2015). "Tip for Opening Large Text Files in Windows". Petri. Archived from the original on 2016-10-29. Retrieved 2016-10-28. ^ "Features of LOG and Time/Date Command in Notepad". Support. Microsoft. July 19, 2005. Archived from the original on June 28, 2007. ^ "How to Use Notepad to Create a Log File". Support. Microsoft. December 20, 2004. Archived from the original on April 6, 2005. ^ " "The Clipboard". Archived from the original on 2009-02-26. Retrieved September 29, 2009. ^ "IsTextUnicode()". MSDN. Microsoft. Archived from the original on 2016-09-10. Retrieved January 28, 2017. ^ Chen, Raymond (April 17, 2007). "The Notepad file encoding problem, redux". MSDN. Microsoft. Archived from the original on 2011-09-03. Retrieved 2019-03-20.